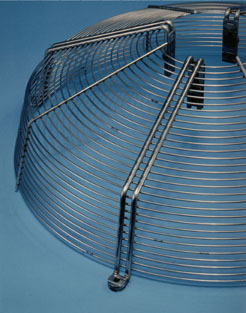 We manufacture lots of different touch and fan guards. All are suited for specified customers and all rights for these guards are reserved the buyer. It is a big advantage if we shall be contacted early in the construction phase. Hereby our experiences can be valuable to eliminate unnecessery costs and avoid "impossible" solutions. A perfect construction can also include an integrated montage of motors etc. We manufacture touch guards in all shapes. 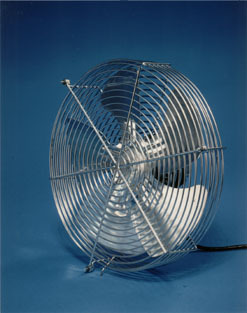 Fan guards in diameters up to 2200 mm:s.
Materials can be normal steel and stainless steel. All kinds of surface treatment will be effectuated. All requiered tools are to be made by ourself. Tig/mig/mag welding max. 350 amps. Resistance welding up to 125 kva. Multi bending machines for wire and stripes max length 275 mm (if round mtrl 3 mm steel). Call us for more details or send us a drawing or sketch to let us give you our offer.